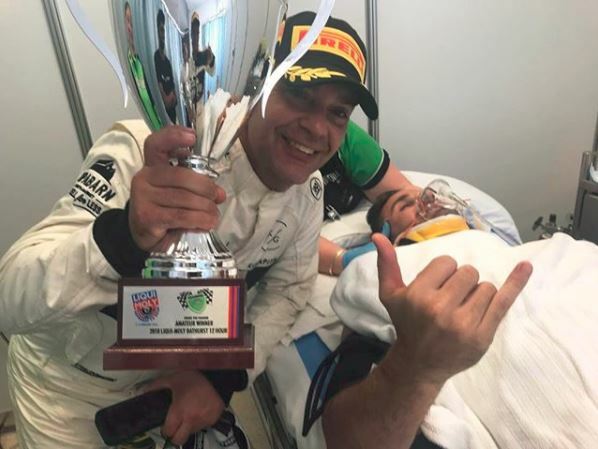 Ash Walsh has received his Am Class winners trophy while laying in a hospital bed following the crash which ended his 2018 Liqui-Moly Bathurst 12 Hour. In the final minutes of the race, Walsh found the wall at McPhillamy Park before the unsighted John Martin arrived on the scene. The resulting impact saw both drivers initially being taken to the circuit’s medical centre, before Walsh was expected to be transferred to hospital in Sydney with suspected broken ribs and a punctured lung. However, as the red flag and the race was eventually declared, results were rolled back to the last completed lap, which had Walsh placed first in Am Class. Walsh’s co-drivers James Koundouris, Theo Koundouris, and Duvashen Padayachee, stood atop the Bathurst podium after the race before visiting Walsh to present him with his own winners trophy. “Thanks to everyone for the messages of support, I’m doing ok in hospital getting some checkups,” read a post on Walsh’s Instagram. 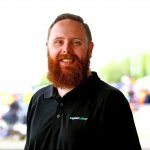 Walsh had recently recovered from similar injuries sustained in the lead-up to the Supercheap Auto Bathurst 1000 while testing an unspecified car at Phillip Island.